The upscale 2015 Volkswagen Tiguan is a compact crossover that offers exceptional performance and handling. Coming into the 2015 model year, the Tiguan comes with an abundance of new standard technology features that increase in-car functionality and safety throughout the roster. The R-line model also receives a brand-new rear bumper that enhances its exterior appearance. In addition to these modifications, the crossover continues to offer a refined ride and high-end power. Read our 2015 Volkswagen Tiguan review to learn more about these highlights and others on the latest model. 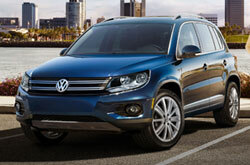 A host of previously available features have become standard on the 2015 Volkswagen Tiguan in Orlando. A five-inch touchscreen display, an iPod cable and Volkswagen's Car-Net connected system are now on every model in the lineup. On top of these features, a rearview camera has become standard, delivering additional assistance to drivers when backing out of parking spaces. Other components such as a panoramic sunroof, keyless entry, leather interior materials, sport-tuned suspension, power-folding mirrors and a Fender audio system are also offered on select models on the roster. Powering the updated 2015 Volkswagen Tiguan in Orlando this year is a turbocharged 2.0L four-cylinder engine, outputting 200 horsepower and 207 lb.-ft. of torque. It can be fitted on front-wheel-drive or all-wheel-drive models and is matched with a six-speed automatic transmission. The front-wheel-drive models produce an EPA-estimated 23 mpg combined, 21 city and 26 highway, while the all-wheel-drive models deliver an EPA-estimated 23 mpg combined, 20 city and 26 highway. Aside from these fuel economy ratings, the front-wheel-drive models can also go from zero to 60 mph in 7.5 seconds, which is particularly fast for a compact crossover. Want to know more about the model? Keep reading our 2015 Volkswagen Tiguan review for additional information, exclusive pics and engine specs. 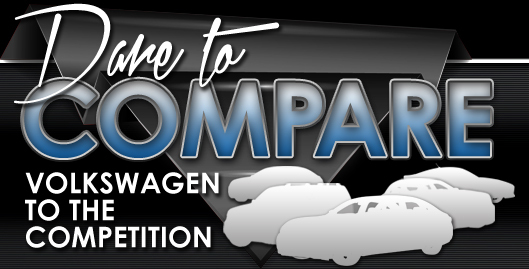 When you compare Volkswagen's most current Tiguan model against the 2015 Toyota RAV4, Honda CR-V and the Chevrolet Equinox, you'll learn that it wins over the competition. 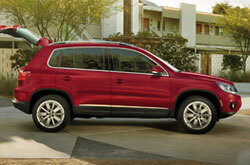 The Tiguan's got several great attributes, including its modern cabin features and pronounced exterior design. For Orlando Volkswagen customers who want a spectacular value, just compare this vehicle's price to the vehicles in its class and you'll see that it's a rock-solid investment. 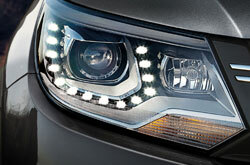 Find even more useful facts; see our quick-facts list for the Tiguan - bullets under this paragraph. If you have further questions about the 2015 Volkswagen Tiguan after reading our review, please contact David Maus VW South using our contact form. Not all car dealerships in Orlando are the same. We feel it's our mission to provide customers with quality vehicle reviews; this sets us apart from the typical dealership. This Volkswagen review contains factual information about the Tiguan and it's specifications, safety technologies and more. Thank you for reading over David Maus VW South's 2015 Tiguan review. Now that you know more about the Tiguan, reach out to us to learn about financing offers and regional OEM deals that can help you save on your purchase.